I'm going to be honest. It seems a little silly to still be updating my New Year's Resolutions in October. I've done a monthly update every month this year and I feel like I'm typing the same things over and over again. And I am making some progress. It's just tiny progress. And some months I've gone backwards on some things. The main reason I've kept at it is because I don't know how to let an idea die I think that revisiting those goals every month has helped me to keep myself accountable. Last week, though, I read this post that made me totally rethink my own accountability. NJ talks about setting SMART goals: goals that are Specific, Measured, Action Based, Realistic, and Time bound. So, instead of just making baby steps for the month of October, I am going to pick a few of my original resolutions and create SMART goals that I will accomplish! Saving money has been on my list. We've had some ups and downs with it, but nothing huge. I know that when it comes to creating savings you have to either make more or spend less. This month I am committing to both. I challenged Ken to a "no fast food" pact. I think we both stop by the drive thru when things get hectic and we don't even think about it. This month, though: NO FAST FOOD! Also, I've picked up a side gig through work administering Praxis tests. It takes up most of a Saturday, but it's good money. I am committing to do one every month that I'm offered. I have one scheduled for October already. Getting in shape has had some real ups and downs. I want to workout, but I can't go to a gym. So I am committed to working out at home. I want to start easy on myself for October. 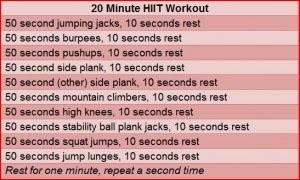 I'm going to do 20 minutes every day of activity. Some days that might mean jumping rope for 20 minutes in the dining room. Other days I'd like to try this (found here). That will help with losing weight as well, so my goal is to lose 2 pounds in October. I run about 130 most days, so I want to see 128 a few times this month! Cleaning is my nemesis. I don't understand how the house gets so messy with all of us gone for 12 hours a day and sleeping another 8! I don't want to spend my weekends cleaning up everything in sight, so I've been working with the kids to get chores assigned and completed. I'm going to dial back my expectations to make them more realistic and attainable. This month, we will spend 20 minutes cleaning together each evening. Monday=living room; Tuesday=dining room; Wednesday=kitchen; Thursday=bathroom; and Friday=bedrooms. I'm bad about remembering before shots, but I'm going to work on those so the afters have some context. Those three things will keep me plenty busy throughout the month, but I think they are totally doable. Thanks to NJ at A Cookie Before Dinner for the virtual kick in the pants! I definitely need to save money more here and have been having a bit of trouble with the last few months and gearing up for Christmas now. Will be trying better once the new year hits for sure. I'm glad I bought some Christmas stuff way back in July! It seemed kinda silly at the time, but it's a good thing I did, so now I won't be so stressed this holiday. Great goals!!! I love that you're setting them! Now, let's hit them! Can't wait to read your update in November! I try to have a cleaning schedule too. It doesn't always work out. I've never kept resolutions in mind this long before. And my goal has never been to "accomplish" them; but more to improve my life overall. Thanks NJ! I'm hoping I have a good report! Cleaning and I just don't get along. It is the last thing on my list of things to do when I am exhausted at the end of a workday! My work totally promotes SMART goals. I think it's great. 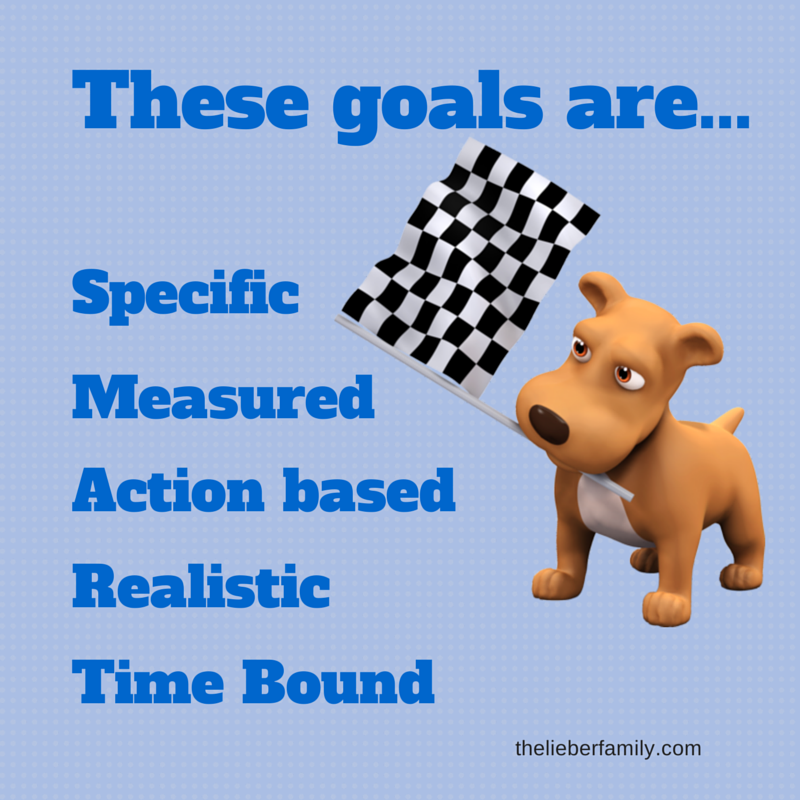 I also like to do "actionable goals," or rather, systems instead of goals. So, instead of saying "I want to save more money," I like to say, "This month we're going to cook budget recipes" or something like that. Now if only I could do that with losing weight lol. Start small. Pick one thing to focus on. Then the feeling of accomplishment will encourage you to do more! That's awesome that you do this at work. It makes more of a connection between your work lie and your private life. I hope that makes it easier to follow through!